OTTAWA - Federal MPs of all political stripes took a Toronto university to task Tuesday for siding with a male student who requested that he be excused from participating in a group project with women. The York University student, whose name has not been released, cited religious grounds for the request. His religion is unclear. Sociology professor Paul Grayson originally rejected the man's request that he be allowed to skip a group project last fall; the student went on to meet with his female classmates as scheduled. But Grayson said he was later told by the dean of the faculty of liberal arts and professional studies that the student should have been accommodated, since the request did not have a 'substantial impact' on the rights of other students. "York is a public secular university with a commitment to equality," Grayson wrote in a Dec. 9 report on the matter that was provided to The Canadian Press. "As a result, my initial assessment was that to grant the accommodation would be to give tacit support to a negative view of women." A statement from the university said it based its decision on a number of factors, including consideration of the Ontario Human Rights Code, the individual circumstances, the requirements of the law and the academic requirements of the course. "A deciding factor in this case was that it was an online course where another student had previously been given permission to complete the course requirement off-campus," said Rhonda Lenton, the university's vice-president academic. "Ultimately, a satisfactory agreement was reached between the professor and the student." The administration's position found no support among federal MPs asked about the controversy Tuesday. "This is what we've tried to combat in places like Afghanistan," Justice Minister Peter MacKay said in an interview. "Building schools there, and ensuring now that millions of girls are able to attend school alongside boys, I believe, is a very positive accomplishment of our country." 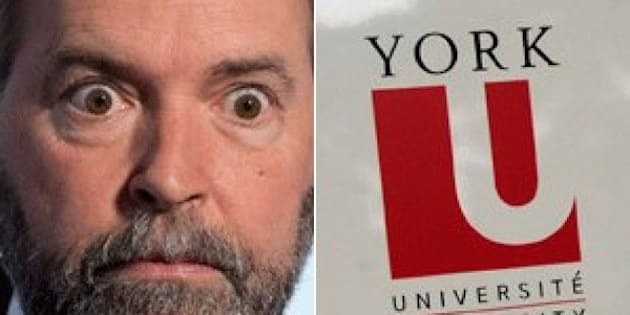 Added NDP Leader Tom Mulcair: "I don't think a university should be accommodating such a demand." Parliamentarians with ridings in the vicinity of York also weighed in. "It's nothing short of ridiculous," Liberal MP Judy Sgro said of the student's request. "We live in a country seeking gender equality.... This is Canada, pure and simple." Conservative MP Mark Adler said in an email that the school "needs to realize that this kind of sexism has no place in Canadian society." It's not the first time the question of accommodating religious beliefs has made waves in Ottawa. The Quebec government is currently holding hearings into its proposed charter of values, which would restrict the wearing of conspicuous religious symbols such as turbans and hijabs by public-sector workers. Federal parties, with the exception of the Bloc Quebecois, have roundly criticized the legislation as unnecessary and infringing on religious freedom. But MPs have shown their own thresholds for such accommodations in the past. For example, there has been collective support for insisting voters show their faces while casting a ballot during federal elections.